When I first moved to Chicago I had no idea what alleys were good for. TV and mystery books me told why alleys were bad—they were designed solely for muggers and other social outcasts. Whenever I walked by the mouth of an alley, I would look fearfully and move away if I saw anybody. However, it is said that Chicago has more alleys than any other American city—1,899 miles of them according to Facts About Chicago. Over the years I have become accustomed to walking by alleys fearlessly without getting mugged and I have gained an appreciation for the virtues of alleys. Alleys provide a place to run wires and other utilities without obstructing either views or fire trucks. Alleys provide a place to store garbage cans out of smell and sight. They provide shortcuts for pedestrians—often making alleys a good place for observing people and wildlife from your apartment window or back porch. Alleys provide garage access—meaning no driveways or garages in the front. They provide firebreaks and air spaces between buildings. They provide a means for meeting more neighbors. Last, but not least, alleys provide a place for social outcasts to hang out that is not your front porch. Why Chicago has alleys in almost every block is not totally clear. Alleys have been present since Chicago was first laid out. For over a hundred years the Municipal Code has read "Whenever land is subdivided within the corporate limits of the city there shall also be laid out public alleys of a minimum width of 16 feet in the rear of all lots in such subdivisions." Seemingly the Chicago Superintendent of Maps required developers to include alleys for reasons of both fire protection and so that peddlers and other tradespeople would have access to the back doors. Tradespeople were not welcome in the front parlors of 19th Century Chicago. That tradition continues today. 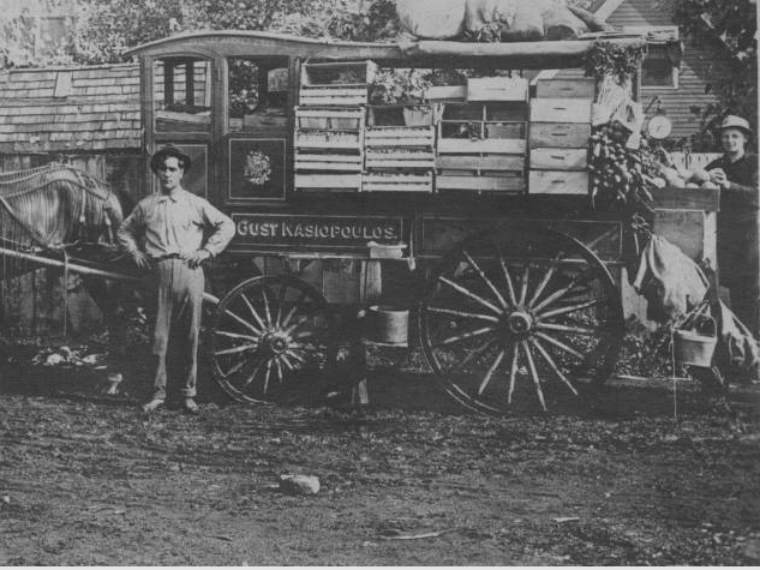 On May 1 and October 1, traditional moving days in Chicago, you can watch inexperienced drivers trying to squeeze their 7 foot 8 inch wide by 26 foot long rented moving vans down 16 foot wide Chicago alleys. It doesn’t seem so bad until you reflect that the vans are made wider by mirrors and the alleys narrower by telephone poles and dumpsters. Also most alleys involve at least one 90 degree turn. According to the The Encyclopedia of Chicago, almost all blocks had alleys until World War I. Then the fashion changed and later subdivisions in the outskirts of the city lacked alleys. 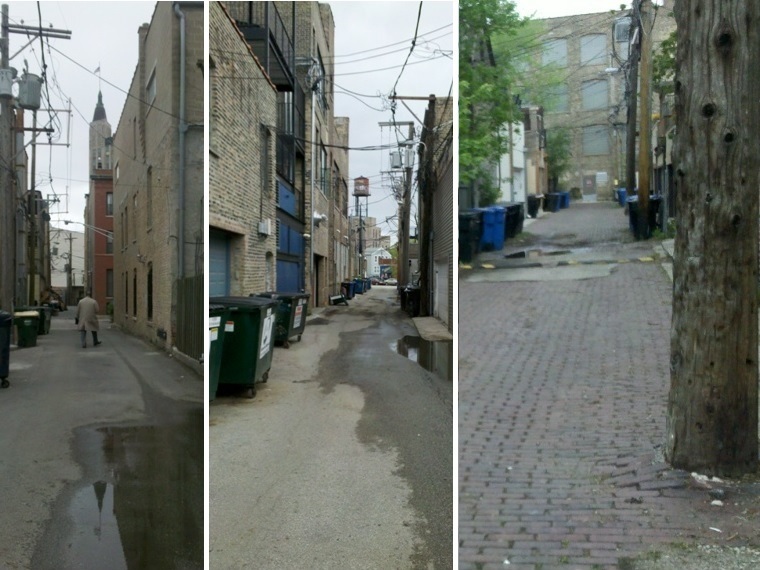 Currently about 90 per cent of Chicago blocks have alleys. Important as they are, there are few books about Chicago alleys. One is City Spaces Photographs of Chicago Alleys. We also have the 1916 City Residential Land Development; Studies in Planning; Competitive Plans for Subdividing A Typical Quarter Section of Land in the Outskirts of Chicago, in which Frank Lloyd Wright and others advocate no alleys. One architect advocates alleys, but no streets, reasoning that the type of people living in new subdivisions will not have many carriages coming to their front door in any case. Apparently he did not realize that within a few years horses would go out of business.